Band of Horses visited The National in Richmond with opening band Susto this past Thursday, June 19th. Even though they had been at the national less than two years ago following their newest album, Mirage Rock, Band of Horses seemed excited to be back in RVA. Opening band Susto, from Charleston, SC, started off the show with a “dark country” or “Americana” splash, as they claim to be on their website. With more of a country twang than the folksy Band of Horses, they were similar in that they were a five person group. Since I was so close to the front, it was easy to see the interaction between the audience and the band blooming from the beginning. Susto sound followed typical country music troupes, complete with steel guitar and lyrics such as “…I saw it in your eyes and now I feel it in my bones. Have you ever felt this way?” from their song “Dream Girl”. However, they also danced a fine line away from traditional country topics - their take on religion with the song “Black Jesus” spoke directly about lead singer Justin Osborne’s atheism. In juxtaposition, the song begins with an archetypal church chorus of “Woaahhhh black jesus” (no, not like black Betty). SUSTO - Black Jesus from SUSTO on Vimeo. In the middle of Susto’s set, Ben Bridwell, Band of Horses’ lead singer, ran out carrying a tambourine to assist the band in one of their songs. Over an excited crowd, Osborne eagerly told everybody that Bridwell is one of the nicest guys he’s ever met. Bridwell sang backup vocals as well, which means he took the time to sit and get to know the band well enough to want to learn the lyrics to play with them. His brief appearance was enough to revamp the audience’s excitement to last through the break between the two bands, with chants of “Horses” by members of the audience. Band of Horses came out starting with a calm and slower song which went along with the general peaceful ambiance that the crowd conveyed, as most Band of Horses concerts seem to be (this being my third show, it’s all I’ve experienced). This didn’t take away from the love the dire fans showed the band, however. The band, Bridwell in particular, was very willing to participate in the audience’s shenanigans, including one member beating on the fence dividing fans from the stage to keep time during a longer rest in the group’s song “Great Salt Lake”. Bridwell would wait for the fan to hit it before commencing and even asked once for him to do it again so he could get into the groove better. The other band members had a huge presence as well. Specifically, Tyler Ramsey, one of the band’s guitarists, quietly loomed over the crowd with all his guitar-god-esque glory. As filler between songs, Ramsey even got to show off some of his amazingly talented solo work. Ryan Monroe showed talent as well as versatility when switching from his main instrument of organ/piano to play rhythm guitar starting with “Weed Party” and playing for a few more songs before switching back. The three of them also displayed some of their acoustic set which they released a live album for on February 11th of this year, Acoustic At The Ryman. Band of Horses walked off waving, leaving their fans satisfied and relaxed. It seems they love Richmond, as they’ve said at both shows at the National, I hope they will most definitely be back in the future. 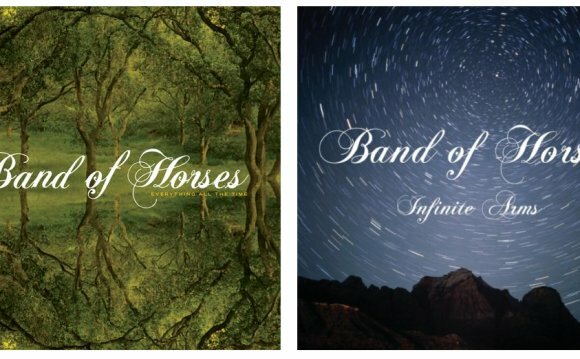 If you’re a fan of unwinding at a concert to the sounds of simple folk music, the next Band of Horses concert is where you’ll need to be.